An Eric and Tiff date night! Another trip down to Buffalo, this time we stayed over at my parents house since it was a Saturday night. We made our way down to the Waiting Room on a fairly cold and snowy night, which probably contributed to the sparse attendance. Though few, there were Will Hoge die-hards that did attend, and we had ourselves a grand old time. Not long after arriving, we ran into Jennifer, our Rochester acquaintance from the Iron Works show, and pretty much hung out with her all night, which was a lot of fun swapping stories. The Waiting Room, and particularly the Studio upstairs where we were, is an even smaller place than Iron Works. This was like he was playing in our living room, especially considering it was just Will, solo acoustic. One very nice surprise is that there was no opener! We didn’t get a lot of warning as Will just walked right up and started in on Daddy Was a Gambling Man. There was a lot of audience banter and storytelling, and a lot of laughs. It was a super intimate show, and to that end, he even took a request that was not on the setlist for Someone Else’s Baby. 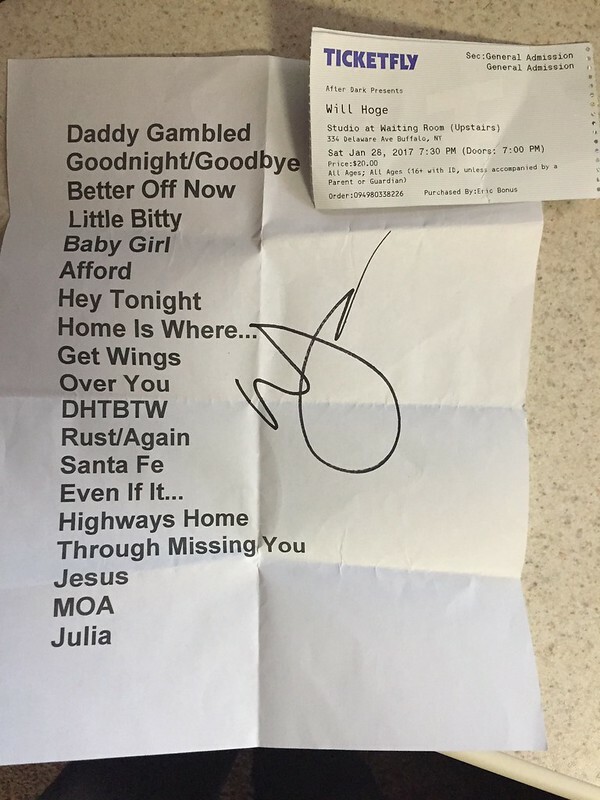 We also got two new songs that are going to be on his new album (Little Bit Of Rust and Cold Night In Santa Fe), both of which sounded quite good. There’s not a ton more to say other than this was a lot of fun, seeing an artist we both love, in a really small place. Will came down and met with just about everyone after the set, so it was very cool to thank him for coming back, and thank him for the music!